Editorials Archives - Jewish War Veterans of the U.S.A.
Post 749 sponsoring packages for troops temporarily stationed at Fort Bliss during Hanukkah. 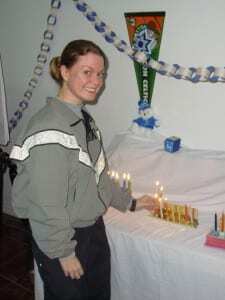 SGT April Honig celebrating Hanukkah in Mosul in 2006. During the monotony of deployment, one thing that troops look forward to is mail. It is a small gesture from someone in a place of homeland comfort that can go a long way both physically and mentally. Receiving a package from a loved one or organization can change a service member’s mood and ultimately raise their morale. There are many organizations that send packages to Jewish troops such as Aleph, Major Stuart Adam Wolfer Institute (MSAWI), Kosher troops and JWV to name a few. MSAWI was established so that the legacy of Major Stuart Adam Wolfer’s leadership, commitment to country and community service will live on. Stuart Wolfer was killed in 2008 while serving in Iraq. Supporting service members morale is a way for people in America to make a positive difference. A servicemember’s morale affects mental, moral, physical condition and ability to overcome obstacles. Poor morale can even lead to loss of victory. It is special to receive care packages during holidays when the weight of being away from family feels heavier. Organizations often send special packages for holiday festivities. Sending care packages to those of the Jewish faith is not new. During World War II the three sons of the owners of Katz Deli in Manhattan, New York were serving in the armed forces, according the Katz website. The owners were in the habit of sending food to their boys and encouraged other parents to do the same. The campaign during World War II of sending food to Jews in service became known as “Send a Salami to your Boy in the Army.” The catch phrase was first heard by Rose Tarowsky, mother of Izzy Tarowsky, who served in the South Pacific as a bomber pilot. Today, Katz Deli supports troops stationed in Iraq and Afghanistan with special shipping for U.S. military and care packages. To support the effort of sending care packages, visit the websites of Aleph, KosherTroops, MSAWI, JWV SOS program, or Operation Macabee. 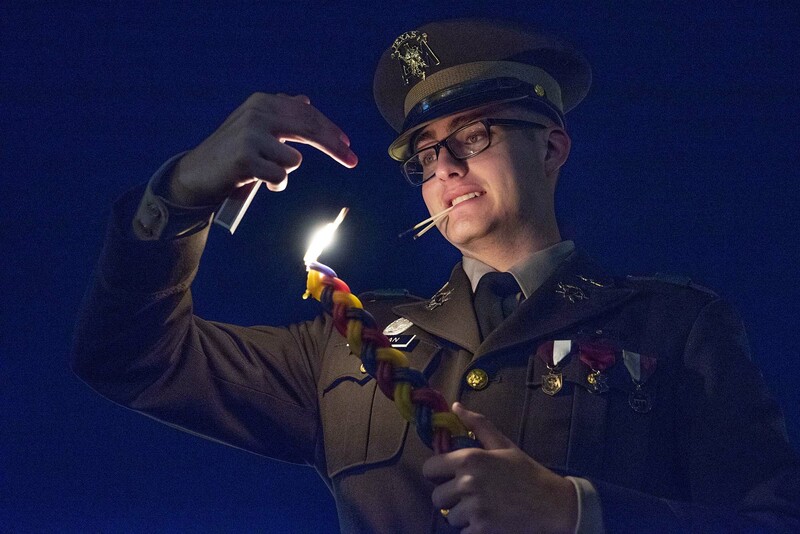 Army Cadet Jacob Widman from Texas A&M kindles a Havdalah candle during a Jewish ceremony marking the end of Shabbat in Washington D.C.
Jewish Warrior Weekend, an event which brings together Jewish cadets and midshipmen for a weekend of learning, comradery and celebration of Judaism, took place in Washington, DC, November 8-11. The event brought together forty-nine officers in training, who had the opportunity to learn about the history of Jewish military service in America. On Friday, Shabbat services were observed and Saturday evening’s activities included a Havdalah ceremony outdoors in DuPont Circle. Havdalah is a ceremony that marks the end of the Shabbat and is supposed to reawaken the senses, including smell. In the crisp fall air, cadets and midshipmen placed their arms on each other’s shoulders and swayed in a circle while reciting prayers, watching the glow of a colorful Havdalah candle, sipping from the Kiddush cup and smelling the ceremonial spices. People in the area stopped to watch and photograph the cadets and midshipmen as they joyfully sang and chanted. 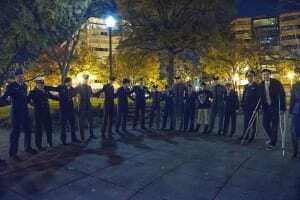 Jewish cadets and midshipman celebrate Havdalah in DC. After the ceremony, Rear Adm. (Ret.) Paul Becker shared inspirational advice to the young future officers on Jewish military life. Often times there are only a few Jewish service members at each a command. “In some cases, you might be the first Jew they meet and they may have some stereotypes,” said Becker. Therefore, he stated that Jews in a command have a responsibility to represent a culture. He also stated that it is possible to abuse this representation by overly requesting leave or attempting to fool others about Jewish holidays. Sunday began with a guest speaker – former Army Officer Phil Carter, a senior researcher who focuses on veterans, military personnel and civil-military relations. The weekend ended on a somber note, with a visit to the United States Holocaust Memorial Museum on Sunday afternoon. Ben Kane, Programs Assistant at JWV, led interested participants on a tour. Jewish Warrior Weekend is an annual Shabbaton program. This year was sponsored by the Jewish War Veterans of the USA, National Museum of American Jewish Military History, USAA, Jteen Philanthropy, Joseph Goldstein, Rabbi Steven Rein, Dallas Jewish Federation, Temple Sinai, Temple Micah and Stratton-Petit Foundation. Hanukkah service held in Iraq. A well-known fact among the international Jewish community is that sometimes observing Jewish traditions and a Jewish lifestyle can be difficult. For Jewish American military service members overseas, this difficulty stems from a variety of sources. 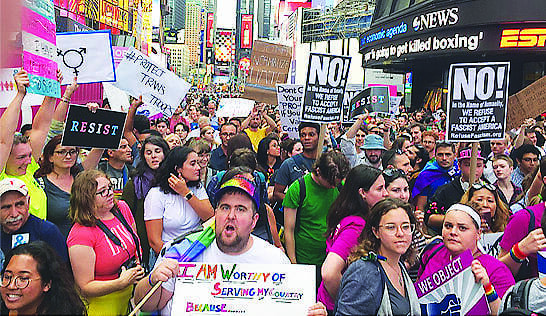 It can come from anti-Semitic fellow service members, from being in a country that is hostile to observers of the Jewish faith, or to simply not having the right items needed for Jewish holidays and customs. One place where being a Jew in the military would likely have its fair share of difficulties is Iraq. 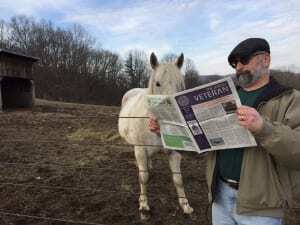 Yet, as this story demonstrates, Jewish U.S. military personnel often find a way to express their Jewish faith and traditions even in potentially unfriendly environments. In October 2005, an idea amongst several Jewish American service members took shape- to plan and hold a successful Hanukkah party or two in Iraq. It had been several years since the last Hanukkah party, and they believed it was due time to celebrate the festival of lights. Calls were made to various organizations that would likely help with the efforts to carry out the party, with Colonel Nelson Mellitz contacting the Jewish War Veterans of the USA. His association with the JWV would continue for years and into the present, with Col. Mellitz eventually becoming the Department Commander for the state of New Jersey, as well as the National Quartermaster. Calls were made through the U.S. Embassy in Iraq, through the chaplain’s services, through the JWV, and as the word spread, the trickle of Hanukkah memorabilia sent their way turned into a flood. Col. Mellitz soon found his desk and surrounding space in the Baghdad embassy had enough Hanukkah memorabilia for parties far into the future. The effort to celebrate Hanukkah in Iraq was not without a few hiccups. Hesitation amongst some of the captains and lieutenants involved in carrying out the plans for the parties provided some difficulties. The hesitation was rumored to be anti-Semitic in nature, but any issues were resolved by the generals, as well as on an ambassadorial level, allowing the plans for the festivities to proceed. 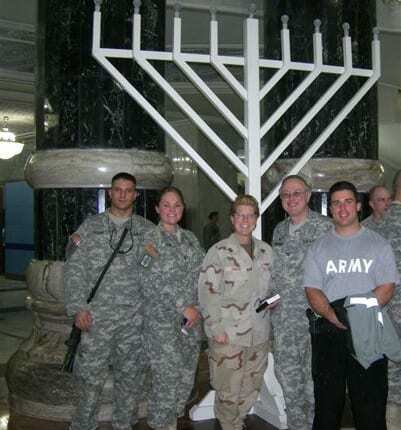 Army SPC and fallen service member Daniel Agami (far left) stands with the giant Menorah in Iraq in 2006. As if the Hanukkah celebrations being held in Iraq were not unique enough, the specific location of the parties is noteworthy. The celebrations of the festival of lights for this year and for several after were held in the former palace of Iraqi dictator Saddam Hussein. His opulent palaces, once the seat of power of a tyrant, was now being repurposed for good- for beautiful Hanukkah celebrations. Hanukkah parties at the palace featured music, dancing, and no small number of latkes and chocolates. Included in the agenda were more serious notes like speeches from dignitaries, including Zalmay Khalilzad, at that time the U.S. Ambassador to Iraq. Initial questions of whether he would be able to attend or not were eventually answered when embassy security staff began posting troops around the area and combing the area with their dogs. A focal point of these celebrations was the colossal menorah that was designed by LT. Laurie and constructed by the Army Corps of Engineers and the military contractor KBR. Humorously, the Army Corps of Engineers Captain who was tasked with overseeing construction efforts had no idea what a menorah was until then. The menorah soon became synonymous with the Hanukkah parties at Saddam’s Republican palace and was on display whenever a Hanukkah party took place there. Many, but not all, of the attendees were Jewish, Col. Mellitz said, creating a heightened sense of camaraderie between service members of different faiths that hopefully has lasted long after the celebration and deployment ended. The Hanukkah parties at the palace and at nearby Camp Liberty, represented by the towering menorah in the palace and at Camp Liberty, served as symbols not just of the overthrowing of tyranny, but of the resilience of the Jewish people and their ability to honor Jewish traditions and customs anywhere in the world. USS Dwight D. Eisenhower (CVN 69) at sea. menorah. It was a moment of normalcy during a deployment that felt long and stressful. We were three different ranks and had three very different duties, and yet, we slowly recited the Hanukkah blessing in unison. It was a moment that brought three of us together to practice an ancient tradition. It also connected us with our families back home. Hanukkah is an eight-day, winter holiday also known as the “Festival of Lights”. Hanukkah means “dedication.” It is a celebration of the re-dedication of the Holy Temple. To me, while deployed in foreign seas, dedication was a significant word. 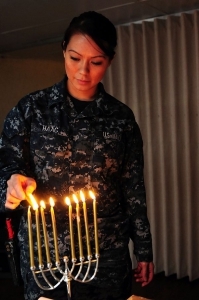 As a sailor on my first deployment, Hanukkah was a Jewish reminder of being part of something bigger than myself. The ship had a dedicated mission. Also, our small Jewish gathering was dedicated to celebrating Hanukkah at sea despite our busy schedules and the small, yet significant number of us. SFC Christopher Celiz. Photo Credit: US Army. WASHINGTON – Over the summer, we lost another one of our brothers in arms. 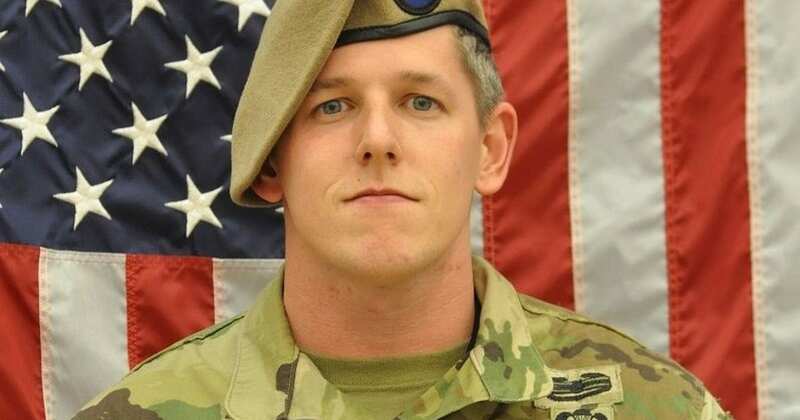 Sergeant First Class (SFC) Christopher Celiz, a member of the 1st Battalion of 75th Ranger Regiment, died July 12 of wounds suffered as a result of enemy small-arms fire in eastern Afghanistan’s Paktiya province. He was 32. “While conducting combat operations in Paktiya province, Celiz was wounded by enemy small arms fire,” stated a U.S. Army Special Operations Command press release. “He was treated immediately and medically evacuated to the nearest medical treatment facility where he died of his wounds.” He was part of a team of Army Rangers supporting the CIA in an intensifying effort to kill or capture top militant targets. Celiz was born in 1986 in South Carolina, and he was a native of Summerville, SC. He attended Summerville High School, where he participated in JROTC. 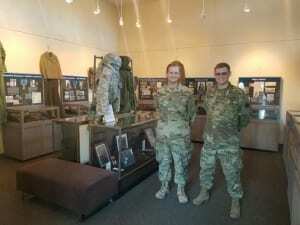 According to one of his JROTC battle buddies, they would spend weekends together competing at drill meets and hanging out at one another’s homes. It was at Summerville High School where he also met the love of his life, with whom he shared an 8 year old daughter. He enlisted in the U.S. Army in September 2007 after completing two years at the Citadel. In 2013, Celiz was selected to serve with the 75th Ranger Regiment as a combat engineer. 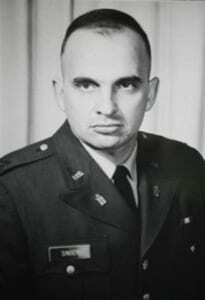 He served with 1st Battalion as the Battalion Master Breacher and engineer and then later as a mortar platoon sergeant with Company D. At the time of his death, Celiz was serving as the battalion mortar platoon sergeant. Temple Mikve Israel. Photo Credit: Temple Mikve Israel. 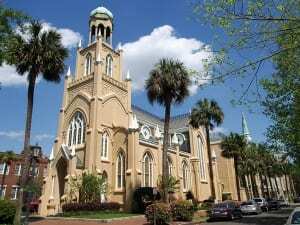 His funeral took place Wednesday afternoon at Congregation Mickve Israel in historic Savannah. Flags were lowered at half-staff throughout the state in his honor. Hundreds of mourners filled a Savannah, Georgia, synagogue to remember a Jewish soldier killed in action in Afghanistan on July 12. “When Rob got on the plane to come home for R&R, SFC Chris Celiz shook his hand and told him to have fun and be safe. Rob said, “See you in a few weeks.” Unfortunately, Rob would not see him again. Operation Enduring Freedom began 17 years ago and it seems many have forgotten we are still in Afghanistan, or have become desensitized to that fact. Young men and women are still risking their lives every day, and this young man, a husband and father, lost his life. We cannot forget their sacrifices, or the family they leave behind,” said Kelley, a spouse of a Ranger in the 75th Regiment. The Governor of South Carolina, Henry McMaster, ordered flags at half-staff on July 18th. “As you look at the flag today and see it at half-staff, please take a moment to remember Sergeant First Class Christopher A. Celiz, who made the ultimate sacrifice for our country in Afghanistan, and pray for his family and friends as they, and our entire state, mourn his loss,” McMaster wrote on Facebook. The Jewish War Veterans of the U.S.A. (JWV) mourns the death of SFC Christopher Celiz, and we promise to remind the Jewish community about his service and to remind the world that Jews have and will continue to proudly serve the United States – some, like Celiz, have given their lives. This Veterans’ Day, we will be reminding Jewish communities around the country that the wars in Iraq and Afghanistan are continuing to this day, and we have soldiers, like Celiz, who are still dying to protect our freedom. It is our duty to remember them and to tell the next generation of their sacrifice. The story of Nathan and Bill Krissoff is an amazing story, but it is not the typical generational military story that you are likely to hear. Nowadays, Jewish service members, like the rest of the United States, tend to serve in “generational military families” – that is people who serve tend to have a parent or both parents that serve. However, the story of the Krissoffs is a bit different. Nathan Krissoff, a Jewish native of Nevada, joined the Marines after being told that he was too young to work at the CIA – he wanted to be on the “front line” of the Global War on Terror. Nathan was commissioned as a second lieutenant in the U.S. Marine Corps in August of 2004. During his deployment, 1LT Krissoff led a Human Intelligence Exploitation Team sub-team on 8 different battalion operations and participated in 30 combat patrols. During one mission, his intelligence skills were key to freeing an Iraqi national that was held hostage by terrorists. On December 9, 2006, 1LT Krissoff volunteered to participate on an intelligence mission in the Al Amiriyah and Al Faris area of Fallujah, Iraq. As his unit was returning to base, 1LT Krissoff’s vehicle was hit by an IED when the Humvee drove over explosives that had been buried in a dry riverbed. Nathan, who was sitting in the right rear seat, took the brunt of the blast. He was only 4 months into his 9 month deployment. His funeral was held in his hometown of Reno, NV. His brother, Austin, had just graduated for Marine Officer Candidate School when Nathan deployed. Austin, his parents, grandparents and hundreds of Reno natives were in attendance at Nathan’s funeral. After the funeral, there was a message on Dr. Bill Krissoff’s orthopedic office. 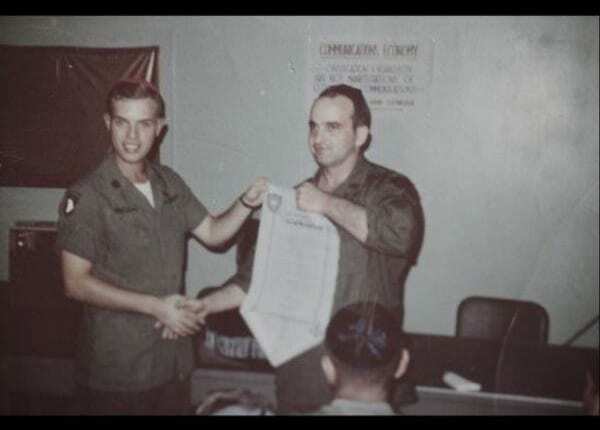 It told patients that Dr. Krissoff was no longer seeing patients because he had joined the U.S. Navy in order to finish his son’s mission to take care of Marines. This came about after President Bush went to Reno to give a speech months after Nathan had passed away, and he met the Krissoffs afterwards. President Bush asked the family if there was anything that he could do for him, and Nathan’s father, Bill told him that he wanted to enlist to finish his son’s deployment. Leaving his profitable practice, Dr. Bill Krissoff was sworn in as a Lieutenant Commander (Lt. Cmdr) in the U.S. Navy in 2007. After completing his training with the U.S. Navy, Lt. Cmdr Krissoff arrived in Iraq to finish his son’s 7 month deployment. According to Krissoff, it was a culture shock to be there – the C-130s spiraling in to avoid getting shot, the blast walls surrounding the hospital “like something out of Mad Max.” Most of the surgeries Krissoff saw weren’t that different from what he was handling back in Truckee – knees and shoulders injured in training. After weeks from getting back from his deployment to Iraq, Lt. Cmdr Krissoff signed up for another deployment, but this time to Afghanistan. Krissoff arrived at Camp Bastion in southern Afghanistan as the battle for Marjah was kicking off in February 2010. In his time in Afghanistan, Krissoff served as the primary or assistant surgeon on 225 serious casualties, including countless amputations. Marines coming into Bastion with a heartbeat had a 97 percent chance of making it to the next facility alive. 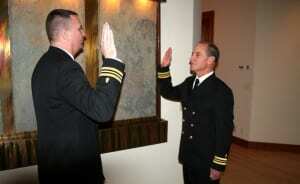 Lt. Cmdr Krissoff continued to serve for six years, and he feels that he did finish what Nathan started. “In most families, dad inspires sons. In our family, sons inspire dad,” Krissoff said. One thing is definitely known for sure, Lt. Cmdr Krissoff definitely did “Earn It”.